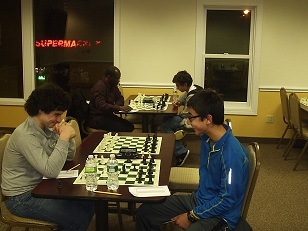 This week’s Friday Night Action was impressively dominated by the Colas duo of Guy and his son Josh. Josh won his section besting NM Daniel Lowinger, expert Alex Eydelman and CCFC Director Melvin Patrick and finished with a perfect 3/3 score! Meanwhile, Guy Colas quickly dispatched of his lower rated opposition in the first two rounds and then ground out a win against Noah Arthurs in the final round to also finish 3/3!